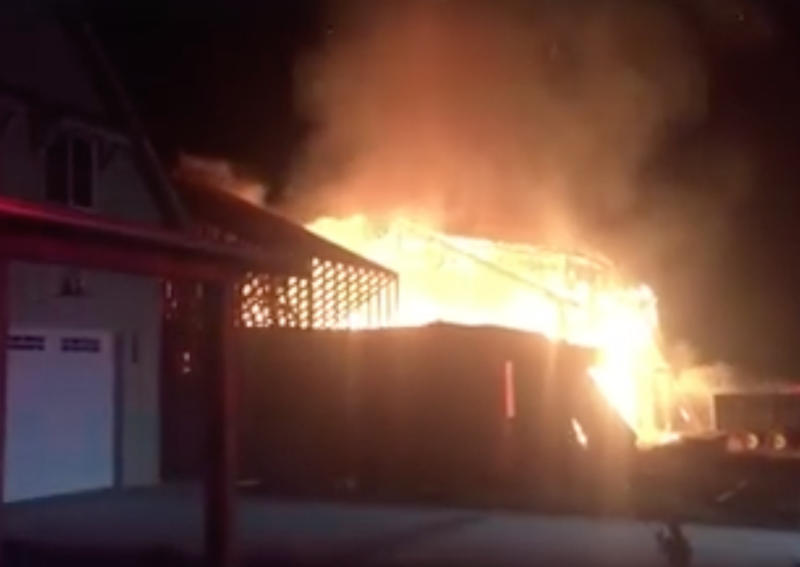 Following several reported threats, an arsonist likely set a fire Wednesday night that burned a home under construction in Nipomo. The home was one of seven houses being built to shelter 112 or more foreign nationals who would come from Latin America to work on a local strawberry farm. Around 11:25 p.m., Cal Fire received a report of a fire on Mad Place in Nipomo. Firefighters responded and extinguished the fire by about 11:45 p.m. The fire destroyed the home’s frames, which builders had recently laid. It also damaged a second home under construction. The homes are located in a residential neighborhood off Tefft Avenue near Highway 101 and the Dana Adobe. Greg France’s plan to house a minimum of 112 migrant workers in seven homes located in a residential neighborhood has resulted in misinformation, anger, threats and intimidation. The workers provided through the federal H-2A program will be primarily men from Mexico and Central America who will live 16 to a home for approximately nine months out of the year. Three of the finished homes on Mad Place. On March 28, the South County Advisory Council sent out an email announcing a discussion on the matter, which they failed to place on the agenda. At the meeting, a group of about 40 Nipomo residents raised concerns about crime, noise levels and the effect the migrant housing would have on their property values. On March 29, South County Advisory Council Chairman Art Herbon sent an email to council members and the media claiming that the project was permitted because of a loophole and that the county had sanctioned the project. However, the county has no jurisdiction over the number of people permitted to live in a home and France is not required to bring his plan in front of the county. While the California Building Code requires that no more than 16 persons live in a single-family residence, local ordinances restricting the number of unrelated people living in a home have been deemed unconstitutional by the courts. Supervisor Lynn Compton has been working with planning and county counsel staff to determine if they can prevent this type of use in the future through an ordinance restricting business uses in residential neighborhoods. At the April 4 San Luis Obispo County Board of Supervisor’s meeting, Compton asked staff to place a discussion about commercial uses in residential neighborhoods on a future agenda. Nevertheless, Herbon had already sent another email, as chairman of the council, claiming that the bulk of cities and counties in California have ordinances limiting occupancy. He requested that his email be forwarded to hundreds of HOA members in Nipomo without consulting with county officials or staff, Compton said. However, in San Luis Obispo County, the city of San Luis Obispo is the only community with an occupancy ordinance restricting the number of persons in a home, which several local attorneys including county counsel said is unlikely to survive a legal challenge. Following Herbon’s emails, online arguments over property rights versus allegations of racism became heated with some discussing burning down the homes and another placing France’s home address online. Cal Fire officials said they could not come up with any scenario other than arson being the cause of the fire. An investigation into the blaze is ongoing. The federal H-2A program allows employers to file petitions for foreign nationals to temporarily enter the United States to perform work that citizens will not do. Foreign applicants are screened and those with criminal records are not permitted in the program. The employer must then provide housing and transportation for the workers. France is currently housing his migrant workers at hotels in Ventura and busing them to and from the work sites. Construction on some of the homes is already complete, and the farm workers are scheduled to move in to three of the homes on May 1. Now come on, in today’s culture we don’t assign blame to individuals. Blame goes to Society for being racist and xenophobic…right. White privileged, patriotically, and institutional bakery is all in there somewhere. But Never…never put the blame on the individuals because if you do….you admit that the emperor has no clothes.